Pictured above 20 years ago is the Thorpe Wood Under 12 football team. The shot was taken before a 1-0 win over Junior Alliance title rivals Abbey. Robert Whitby scored the goal. From the left are, back, Kevin Cunningham, Ben Hills, Robert Whitby, Saleem Jabbar, Luke Savage, Paul Bird, Oliver Hunt, Nicki Thomasson, front, Andy Gilbert, Matthew Gioia, Matthew Parrott, Gary Doran, Alistair Gordon, Scott Crawford and Wayne Morris. ICE HOCKEY: Brent Gough turned in a man-of-the-match performance for Phantoms, scoring three times in a 6-1 win over Wightlink Raiders. RUGBY: Borough hammered Shropshire champions Newport 62-31 in an RFU Intermediate Cup cracker at Fengate. Wingers Chris Kells and Irmis Kukulskis destroyed Newport with their electrifying pace and both scored two tries. Other scorers were James Clarke, Darian Uys, George Wheble, Simon Banks, Ben Chan and Gedi Liutkus. HOCKEY: Gareth Andrew scored six as City of Peterborough beat Sheffield Hallam 8-3 in the National League. POSH: Aaron Mclean and Danny Crow scored the goals for Keith Alexander’s side, but the real heroes in the 2-0 win at Mansfield were outstanding defenders Mark Arber, Guy Branston, Ben Futcher and Dean Holden. FOOTBALL: Neil Arthur sent four players off and brandished 15 yellow cards in a Peterborough League game between Farcet and Sawtry. He said it was the most bad-tempered game he’d ever refereed. Farcet player/manager James Brattan, one of those to see red, said the referee was ‘clueless’. RUGBY: Borough recorded their first Courage League win of the season when defeating Stoneygate 18-17 at Fengate. Chris Jones slotted a winning penalty with the last kick of the game. Skipper Alan Graham and Kev Roe scored tries. ANGLING: Peterborough’s Paul Green won the East Midlands Winter League match on the Grand Union Canal with 7lb 14oz of perch and roach. Ken Wade (Peterborough) was runner-up with 5lb 13oz. FOOTBALL: Daniele Santoro grabbed a hat-trick for Peterborough Boys Under 14s in a 6-0 win over Leicester in the East Midlands Cup. POSH: Chris Cleaver scored a hat-trick for Posh Youths as they won 3-0 at West Bromwich Albion in the Midland Purity League. 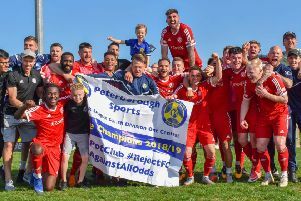 FOOTBALL Ortonians won ‘the clash of the titans’ in the Peterborough League Premier Division. They beat big rivals Perkins 4-1 with goals by Darren Morrow (3) and Darren Bradley. John Wilson was the Perkins scorer. DARTS: Peterborough ‘A’ were flying high at the top of the Fenland Super League following an 8-4 win over Chatteris. Winners were John Hunt, Arthur Cheshire, Ken Summers, Nev Fountain, Dougie Hill, Tom Sentance, Mick Dickins and John Wilson. RUGBY: Borough beat Bedford Athletic 9-0. Eddie Hein crowned a superb display with a try converted by Billy Hall and Phil Webster completed the scoring with a drop-goal. FOOTBALL: Peterborough League sides Peterborough Rovers and Parson Drove reached the last 64 of the FA Vase. Rovers beat Ely City 2-1 with goals by Glyn Tilbrook and Hugh Davies while Drove were 1-0 winners against City of Norwich thanks to a Gary Scotcher goal. ATHLETICS: Peterborough’s Ray Church finished third in the senior men’s race at the Eastern Counties Cross-Country Championships at Orton. FOOTBALL: Two players scored double hat-tricks in Peterborough League games - Malcolm Misson for Wisbech St Mary in a 7-0 win over Doddington and Paul Kirk for Glinton Reserves in a 9-0 thrashing of Newborough. HOCKEY: Brian Bayston, Jimmy Wheeler and Duncan Parkes scored in Peterboough Town’s 3-1 win over Royston. RUGBY: Borough won 21-8 away at Bedford Athletic with tries by Barry Vanstone, Bill Green and Tom McClure. HOCKEY: Nev Parker hit a hat-trick for Peterborough Town seconds in their 6-0 win over Peterborough City. Inky Hughes also had a good game and netted twice. HOCKEY: There was also a hat-trick for Malc Urwin as he steered Co-op to a 4-0 win over Mitchells in the semi-finals of the Iuvenix Cup. Arthur Blood scored the other goal. FOOTBALL: North Cambs Cup holders Whittlesey United began their defence with a 4-3 win against Manea thanks to goals by John Palmer, Terry Barden, Len Allen and Brian Cook. ANGLING: Deeping’s Les Beels won the big East Midlands Winter League match on the Welland with 19lb of bream. CRICKET: Westwood Works umpire Horace ‘Sos’ Mellows was selected by the MCC to umpire first-class county matches. POSH: Brian Wright missed a penalty as Posh lost 2-0 at home to Shrewsbury in Division Three. The reserves drew 2-2 against Fulham at Craven Cottage with goals by Jim Rooney and Gordon Pulley.